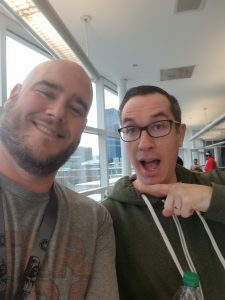 While attending C2E2, I had the chance to sit in a roundtable interview the creators of the shows Robot Chicken. This was my first roundtable and I didn’t expect to laugh as hard as I did. Here’s the rundown. 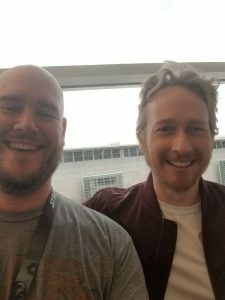 WHAT: The voice-over star, co-creators and executive producers of Crackle’s Emmy-nominated stop-motion animated comedy series, “SuperMansion” discussing season three, some “Robot Chicken,” and their creative process. In the all-new season premiering with weekly episodes starting May 7th on Crackle, the lunatics get the keys to the asylum when Dr. Devizo (Chris Pine) is declared a hero after “saving the world” at the end of last season. He and the Injustice Club are all made honorary members of the League of Freedom. The heroes and villains must learn to live and work together if they’re going to combat the never-ending amount of evil in the world. Bryan Cranston (“Breaking Bad”), Keegan-Michael Key (“Key & Peele”), Chris Pine (Star Trek), Jillian Bell (22 Jump Street), Yvette Nicole Brown (“Community”), Heidi Gardner(“SNL”), Tucker Gilmore (Frozen) and Zeb Wells (The Amazing Spider-Man, “Robot Chicken”)will all return as voice-over stars in the upcoming season. Additionally, Mikey Day (“SNL”) will guest star as Max Penalizer, an anti-hero meting out justice with his Ball Peen Gavel of justice. Matthew Senreich from Stoopid Buddy Stoodios. These three were very generous with their time and the conversation ranged from the effects of energy drinks on the body to how much a performer can shape the Supermansion characters. Since the focus of this piece is Supermansion, here are the major points that were discussed. While not a musical episode, there will be an episode where music will be a focus. Black Saturn’s continued search for love! 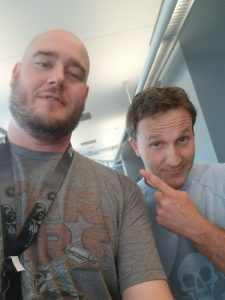 Breckin Meyer had some great stories of how he develops the voices of his characters, “Sometimes it just comes from playing around.” Noting how his voice for Robot Chicken’s King Randor came from annoying one of the producers with a King Randor action figure. As a fan of Supermansion and Robot Chicken, I was ecstatic to meet these guy and they did not disappoint. Login to Crackle on May 7th and check out the new season of Supermansion! My recording device didn’t want to function during the interview, but the folks from Shallow Graves Magazine got some great footage.